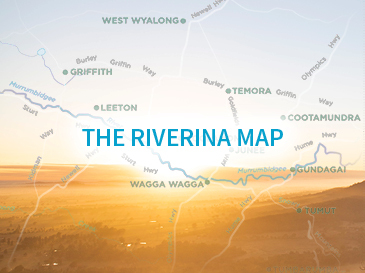 The Riverina is home to the Murrumbidgee River and its waterways, winding its way through an amazing array of food trails, natural wonders and charming towns just waiting to be explored. It’s an escape that’s a world away from the everyday ‒ the perfect place to relax, reconnect and enjoy at your own pace. Visitors can enjoy delicious wine, pick their own oranges or taste artisan delights including locally made chocolate and cheese. With so many delicious adventures in the heart of Australia’s Food Bowl, it’s easy to go with the flow. A road trip in the heart of Australia’s Food Bowl is the perfect way to experience the exhilarating Riverina region. Discover acclaimed wines, taste gorgeous fresh produce and explore spectacular natural scenery throughout the region. Enjoy a gourmet escape in The Riverina, from award-winning wineries and breweries, orchards, providores, to farmers’ markets and farmgate experiences. Fertile soils have long supported an extraordinary amount of fresh produce, earning the region its title of Australia’s Food Bowl. An extensive range of wine styles are made here, the largest wine producing region in NSW. From hiking and mountain biking through colourful wildflowers and parkland, to fishing, boating and camping along flowing waterways, you’ll find memorable ways to explore The Riverina’s breathtaking natural beauty. You can even take a scenic drive to alpine wilderness and relax in a thermal pool. From delicious farmgate experiences to wine tasting in award-winning vineyards, The Riverina is one of the world’s most abundant pastoral regions. Pick fruit in brimming orchards, sample exquisite locally made cheeses and enjoy unique farm stay accommodation with spectacular scenery. From luxurious farm cottages and comfortable homesteads to luxe eco-huts, The Riverina has accommodation options to make your stay an unrivalled experience. Enjoy abundance in rich farm country by relaxing at Kimo Estate, overlooking the mountains of the Great Divide. Hanericka is a working farm with fun activities for kids and Corynnia Station offers high comfort near Griffith.